Another week down, means another week closer to the release of The Hunger Games film, and yesterday I booked tickets for the first screening in Lincoln, which I am very excited about. So, this week I decided to dedicate Makeup in Film to a character that has got to be the most interesting in terms of both makeup and fashion. I can imagine that the makeup artists (all 35 of them!! ), had a complete field day with this one. And the Marketing Executives certainly have, as she has become the face of various Marketing Campaigns for the film, although perhaps most popularly as the face of the China Glaze collection of nail polishes that I've blogged about a couple of times. Banks' look is very natural, and feminine and actually quite low-key. But then again, she doesn't really need that much makeup, because she is already naturally beautiful. 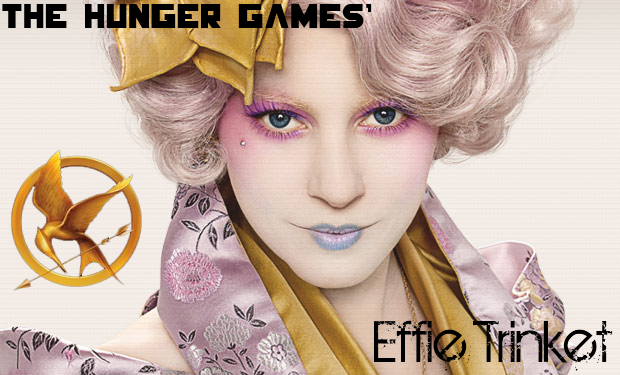 Effie Trinket, on the other hand, couldn't be more "un-natural" in her overall look. 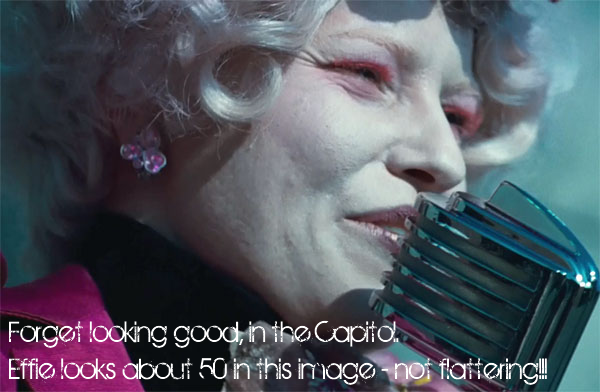 It's hard to know how to describe Effie's Capitol Look, other than Eccentric, Bold, Quirky, Wild and Colourful. 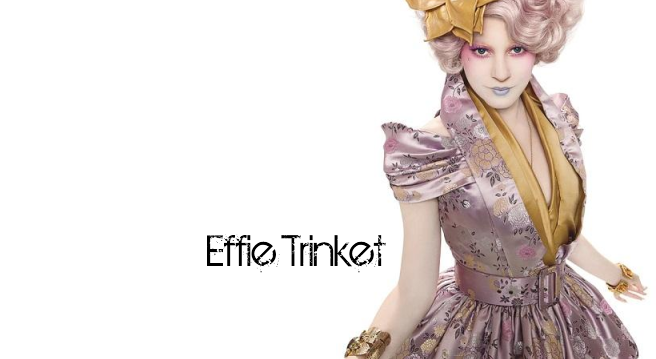 Looking at images of Effie, such as the above one, her style is quite stylish and you can honestly imagine it fitting onto the Catwalk of any of the leading Fashion Shows across the world, which, let's be honest, are more artsy in style and appearance than any of the clothes that regular people would ever even dream of wearing. However, look closer at her, in some of the cut scenes from the available trailers, and Effie's skin is a completely different story. It's hard not to think that this close-up actually offers a deeper glimpse into the reality of Effie's look, than the character would care to admit. Nevertheless, Banks has commented to the media, several times, in magazines including Glamour and Total Film, regarding the pains and realities behind the seemingly stylish and perfect look. You might think that Effie's skin is looking "rough", but that honestly is not even the half of it. Apparently, Banks used "sandpaper" on her skin, "to show that Effie has a cracked veneer, that perfection doesn't exist in the Capitol - it's actually become hideous." This idea of faux perfection, reminds me of a scene from the 1995 film Clueless, in which Cher asks her male friend Christian if he thinks that Amber is pretty. In response, Christian describes Amber as being like "an oil painting", in that she looks great from a distance, but close up she's not that great. It's an interesting idea, as close-up you can see Effie's creases around her eyes and the texture of her skin seems quite revolting, in a way that ages the character significantly. And Banks even points out that she "wanted her to be tortured by her clothes", in the same way that she is tortured and manipulated by the Capitol, in the way that it controls everything about her, from her personality, to the way she looks. I guess it's kind of like saying that, that the people of the Capitol might appear to be living this life of luxury, above the other Districts, but in their own sadistic way, they are suffering just as much. There is of course, one aspect of Effie's look, featured in the China Glaze campaign, that I absolutely love. And that has got to be those eye lashes!! Banks' eyelashes appear to be quite light and subtle, but the addition of the false lashes to her upper lid and the outer corner of her lower lid, these really make an incredible statement. I love the fact that they have butterflies on them, and there is something so whimsical and so intriguing about them. I've seen some fairly creative lashes, in my time as a beauty blogger, but these are just so amazingly artistic. I'm not sure how much I'd like to wear them, but they look fantastic. Effie is certainly an interesting character in so many ways. On the surface she comes across as being so superficial and annoyingly naive, however, underneath that "pretty" facade, you can just about catch a glimpse of a very vulnerable and controlled woman. 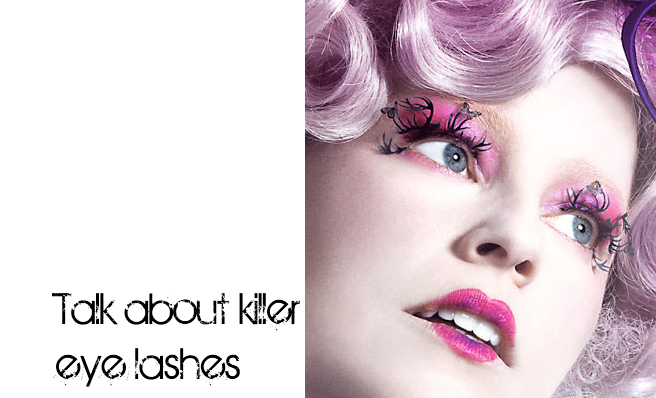 What do you think of Effie Trinket's crazy looks? And do you think that Elizabeth Banks and the stylists and makeup artists have done a good job bringing Effie to life? I've been hearing so much about the Hunger Games - can't wait to see what it is all about! I only heard about this film recently through the beauty community. If you hadn't included a picture of JD's baby momma i'd have NEVER in a million years guessed it was her! I couldn't believe that it was Elizabeth Banks after I saw the promo shots of Effie. Definitely a step away from her perfect and beautiful role as Avery Jessop in 30 Rock. The baby pink satin dress is beautiful and the China Glaze promo shot is gorgeous. I'm sure I've seen the lashes on sale somewhere but I can't remember where. I kind of want to wear my makeup like her.